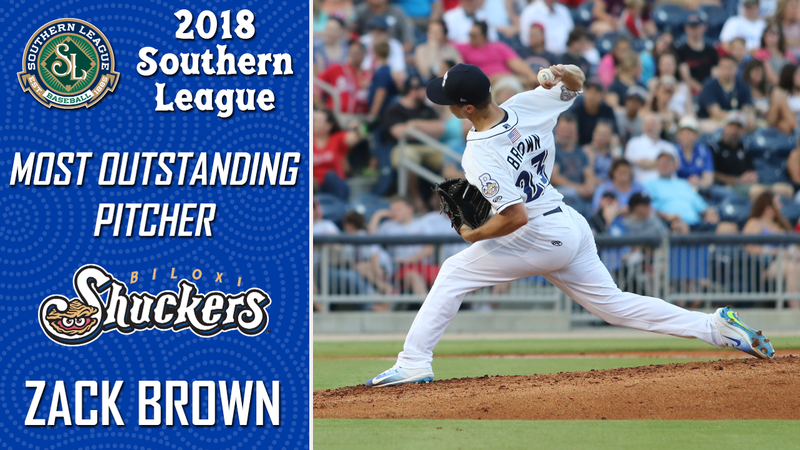 Shuckers RHP Zack Brown has been named the Southern League's Most Outstanding Pitcher for the 2018 season. Brown joins Corey Ray and Manager Mike Guerrero in completing the Southern League awards sweep after Ray earned Most Valuable Player and Guerrero took home Manager of the Year. In his third professional season, Biloxi's right-handed ace has produced career-best numbers in Wins (9), ERA (2.48), Innings Pitched (119.2), Strikeouts (113), Games Started (20), Batting Average Against (.208), WHIP (1.05), and Hits per 9 IP (6.8) with five games remaining in the regular season. His ERA and winning percentage lead the Southern League in 2018, while his WHIP and Batting Average Against rank second. The Shuckers have also compiled an 18-2 record in games that Brown has started this season, and a 19-2 record in games in which he makes an appearance. The most unforgettable performance of Brown's season came on a Friday night in June against the Mississippi Braves. With the Shuckers' magic number down to one to clinch a first half South Division Title, Brown took the mound on June 15. The Milwaukee Brewers' #8 prospect led Biloxi to a first-half crown in style by tossing a complete game, one-hit shutout. The right-hander struck out eight while taking a perfect game into the eighth inning and a no-hitter down to the final strike. Brown proved to be a model of consistency all season long. Prior to suffering an injury in a start on July 15 that shelved him for a month, he pitched through the fifth inning in each of his first 16 starts. The University of Kentucky product complied 11 quality starts throughout the year and made 16 appearances where he did not allow more hits than the number of innings he tossed. Perhaps most impressively, Brown has not allowed a home run since June 10, a span of 45.2 innings. Between his May 31 and June 5 starts, Brown twirled back-to-back games where he set a new career mark in strikeouts. The 2016 5th-Round draft selection fanned a career-high ten in a win against Mississippi at MGM Park, and followed it up five days later with eleven punch outs in Pensacola. Brown joins Jorge Lopez as the only other pitcher to win the Outstanding Pitcher award for the Shuckers. Lopez spent the entire 2015 season with Biloxi, posting a 12-5 record with a 2.26 ERA. Over 143.1 innings, Lopez struck out 137 Double-A hitters. Brown and the rest of the Shuckers are home for the final five games of the regular season beginning on Thursday night. The Shuckers then stay in Biloxi for Games One and Two of their South Division Championship Series matchup next Wednesday and Thursday nights at 6:35 PM CT at MGM Park.